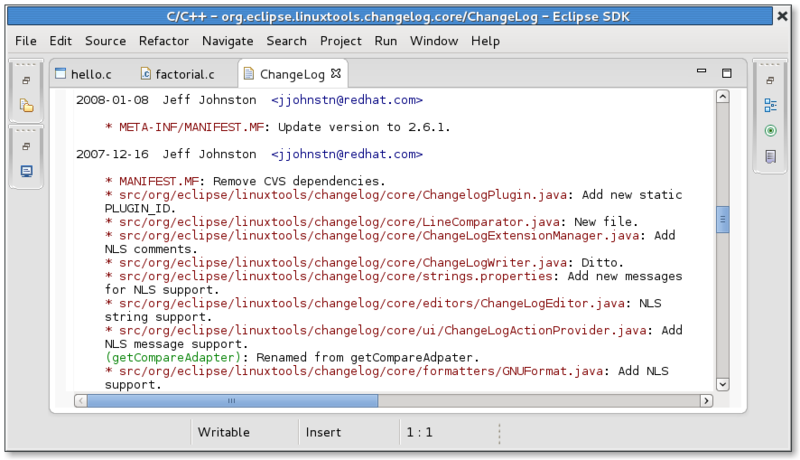 The ChangeLog plug-in provides a special editor for ChangeLog files. This editor has syntax highlighting and provides a file-hyperlink feature. To use the file-hyperlink feature, hold the Ctrl key and click on any filename to open the corresponding file. You can also copy all ChangeLog file changes (since the last check-in to the repository) to the clipboard. To do so, first select the ChangeLog file containing changes since the last commit and, then, use the key combination Ctrl+ Alt+ v to copy those changes to the clipboard. This is useful if you wish to use the ChangeLog entry as your comment when you perform a commit.